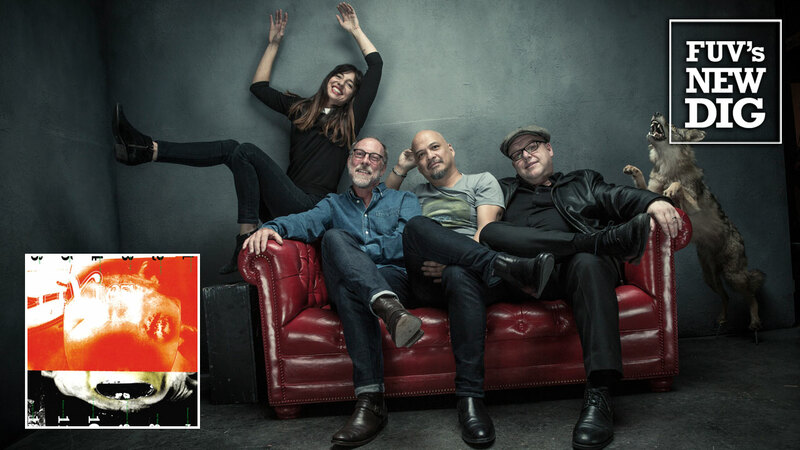 Pixies have a new album which comes thirty years after the band first formed, proving that not everything mellows with age. Sometimes it roars on, as defiant and loud as ever. On the band's new album, Head Carrier, Pixies do not attempt to change what they’ve always been about. Instead, they fortify the sound that established them as a leading force in the alt-rock scene of the late '80s and early '90s. It’s a sound that broke new ground, paving the way for the indie and grunge boom. The new songs on Head Carrier encapsulate all the qualities of classic Pixies: aggressively loud guitars, bone crunching riffs, and melodic chords. There are frontman and guitarist Black Francis' sometimes off-kilter, maniacal vocals, that sometimes drift into sweet harmonies, and a keen sense of vintage ‘60s pop and surf rock. It’s an everything-but-the-kitchen-sink sonic assault that manages to hang together in a frenzied display of force and form. In “Baal’s Back,” Francis’ vocals become a chilling and otherworldly primal scream; a song that could easily be embraced by death metal fans. “Um Chagga Lagga" addresses roadside prostitution while “Plaster Of Paris” is a catchy dose of power pop with sunny guitar interjections. The driving “Talent” shows a sarcastic side to Francis’ writing. Head Carrier is the sixth full length album released by Pixies, but only their second since reforming in 2003. The band marks its 30th anniversary this year, forming in Boston in 1986 with Francis, Deal, lead guitarist Joey Santiago, and drummer David Lovering. Following groundbreaking albums like 1988's Surfer Rosa and 1989's Doolittle, tensions within the band led to their early 1993 break up, followed by a decade of silence from the quartet. But, by 2003, they drifted back together again. Pixies would spend the next nine years away from the recording studio, concentrating on touring. But Deal’s 2013 departure prompted Pixies to record new material as a trio for a series of three EPs. Guitarist and vocalist Kim Shattuck briefly joined Pixies to fill Deal’s void, but left after six months. Lenchantin joined in 2013. The twelve songs from the EP trilogy were released as 2014's Indie Cindy, the first new Pixies album in 23 years and their first without Deal. From here, the stage was set for Head Carrier. On the surface, the presence of new member Lenchantin and producer Tom Dalgety, might signal the beginning of a new era or a change in philosophy, but that’s not what is in play here. Head Carrier is a reinforcement of Pixies’ explosive sound — caustic, smart and always inspiring.